Ya so ite, ya so ite, ya so ite, you such a showoff. Oh the sass is too much! Glasses, check. Boa, check. Leopard stools, check. Attitude, uh uh no you di'nt, check. You are funny with all your gangsta words, YO, word. Those are great! you really picked up the emotion in the pics! WOW-what beautiful photos of a beautiful little lady, I know you are one proud Moma! Awe, great pictures. It brought so many memories flooding back to me from when I danced...ah, I miss those days. Thank you! LOVE the costumes!!!! She looks terrific out there! The photos are awesome. Your daughter is beautiful! Thanks for sharing! The dance photos are great. Sassy! She looks AWESOME! And I totally want her shoes... even if I am old and silly. Oh how I miss my days of doing that!! Great shots!! Love the 'tude!!! great photos. Your daughter is beautiful. Those are such great photo's. You got it down. Oh, how fun! Makes me miss dancing! Cute costumes! Looks like she's having a blast! 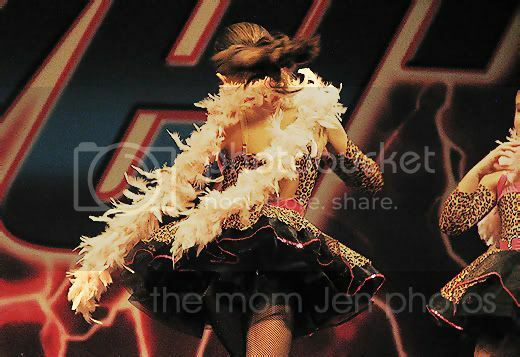 Recital pictures are just awesome! I love the pictures! You need to post a video sometime! I would love to see dance! AWWW love these pictures! Those shoes are so cool! I hope her team did well :-).. she sure looks like she had fun! Wow, your photos are amazing. She looks fabulous and self-assured and all anyone could hope for. Awesome! Way to go, DQ! Those pictures are so so great. I like the shoes in the first picture. Thanks for stopping by my blogs. Love the out fits. my daughter would just want to have them so she could wear them around the house. lmao @ your commentary. very sick kicks tho :) great photos. my oldest would prob love being part of dance like that, i just can't afford all the many activities they keep wanting to do. :( i need to hit the lotto (of course i gotta start playing it first lol). I am so glad youposted pictures from the dance competitions, I have been DYING to see them!!!! What cute little dancers...and your commentary ... hilarious! Now that's what I call cheetaliscious! I bet those outfits were a small fortune but she looks "Tight Yo"! Love her shoes, they are kickin'! Noelle and I really got a kick out of these yesterday. GO J! Wow, that is one sassy outfit! I don't remember getting to wear cool costumes like that when I was in dance (although it was the '80's and my dance instructors mother made them!) She looks great - love the photos! THAT looks like a blast! Great pictures! 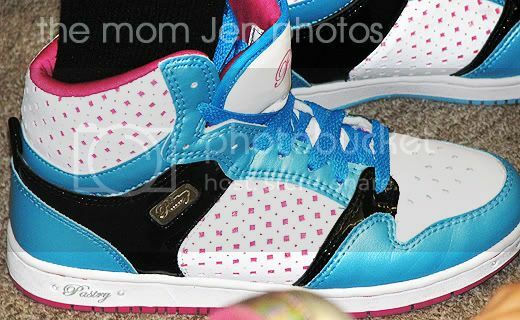 Those Kicks are gansta fo-shi-zoe! I am going to kill my blog reader........rage.............anger...............can you feel it!!! Slamming my keyboard. I missed some of my favorite blogger's posts. do you follow blogs? Or just by clicking on comments? I am just tring to figure out how to manage this. Clearly the reader is not the answer! love the baller kicks. and the dance photos are great!